The one-off "In Breed" series of releases continues at Mountain Goat, with brewer Alana Rees the latest to create a beer for the brewery. 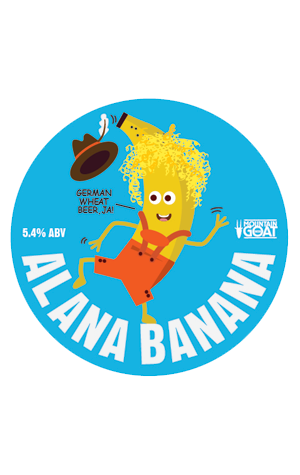 If you've not met her, then we can assure you that the decal image accompanying the keg-only release is a remarkably good reimagining of her as a German banana (admittedly, we've never seen her in lederhosen). We're not sure whether she chose the German hefeweizen style for her brew because it allowed for the rhyming title Alana Banana or because she loves the style. What we do know is that the Goats reckon it's a perfect warm weather beer. We're told it comes packing the "classic banana and clove aromas" of the style, is "clean, crisp, but with a banana / phenolic finish derived from the traditional German wheat beer yeast" and that the clove side of things was given a leg up by the addition of fresh cloves in the kettle.